Castel Sant’Angelo, also called Hadrianeum or Sepulcrum Antoninorum, structure in Rome, that was originally the tomb of the Roman emperor Hadrian and became the burial place of the emperors Antoninos until Caracalla. It was built in AD 135-139 and converted into a castle in the 5th century. It stands on the right bank of the Tiber river and face the Sant’Angelo bridge one of the principal ancient Roman bridges. The burial mound was originally topped with a garden and a golden statue of Hadrian with a four-horse chariot known as a quadriga, but today the fortress features a statue of the archangel Michael. Hadrian’s ashes were placed in the tomb after his death in 138, along with the reamins of his wife, Sabina, and those of their first adopted son, Lucius Aelius. Succeeding emperors were buried in the mausoleum for the next several decades, with Emperor Caracalla as the last in 217. The tomb was converted into a military fortress, and architectural features were continually added to improve the fortification throughout the centuries. Pope Nicholas III famously connected the fortified structure to St. Peter’s Basilica with a secret passageway called Passetto di Borgo, which was to serve as an escape route for the popes if they ever faced danger. 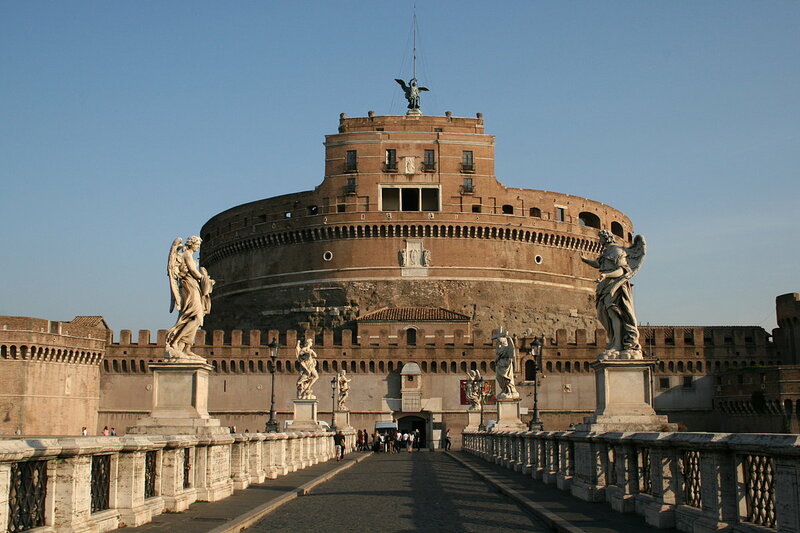 Pope Celement VII did end up using the passage as he sought refuge in Castel Sant’Angelo during the Sack of Rome in 1527. The papal apartments were substantially reconstructed for their residents, and they contain significant Renaissance decorative paintings; one lavishly decorated bedroom is attributed to Raphael. The popes used part of the castle as a prison, and eventually the building became a military barracks and prison. The military use ended in 1901, when the castle’s restoration was begun. Part of it is now a museum of military history.